Every now and then, an article makes the rounds that sound just like this one — all the stupid SEO mistakes you’re making or similar protestations of SEO ignorance. Why? Because SEO is changing, and because stuff that used to work gets you penalized today. This is another list, but it comes with a caveat. I work with a lot of really intelligent and well-informed people. They read Search Engine Journal. They read Moz. They stay up to date. But they still do dumb stuff with their SEO. I feel like we still need some tough conversations about the dumb stuff people are doing. I wrote this for you guys. I consulted with someone recently who managed about 300 websites. Is he a developer? No. He is an entrepreneur who launched a moderately successful B2B. All of those 300 websites are for a single company. Since the company sells about a dozen distinct products, each product has its own website, plus a couple dozen varied websites focusing on the product name and company name, along with a few variations for good measure. I’m aware of quite a few companies who use similar methods. An HVAC repair company may, for example, launch locally focused websites in all the areas where they operate. Instead of just having ABCService.com, why not have a site called ABCServiceSeattle.com? And ABCServiceBelleveue.com? And on and on. What’s the big idea behind this technique? Serial website makers have the same goal as everyone else. They want to gain more traffic and more exposure for their product or service. If one site is good, then won’t a bunch of sites be better? These sites simply create brand confusion, and saddle the company with extra SEO management and web expenses. 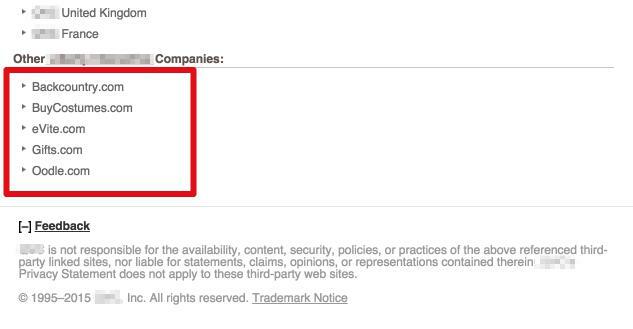 Worse, they run a high risk of duplicate content issues. If these sites start linking to each other, the issue spirals into spam territory. Soon enough, you have a major mess on your hands. Choose a single business site. Put a 301 redirect on all the other sites. These will redirect traffic to the main site. Focus on your main site. If your company has a B2B product and a B2C product, in most cases you should still have a single site. If your business sells different products, don’t create a unique website for each one. Apple is a great example of this. Apple sells items as varied as video cables, TV devices, and desktop computers. Oh, and the iPod. Wouldn’t it make sense to have a website iPod.com? Sure it does, so they do own that domain. 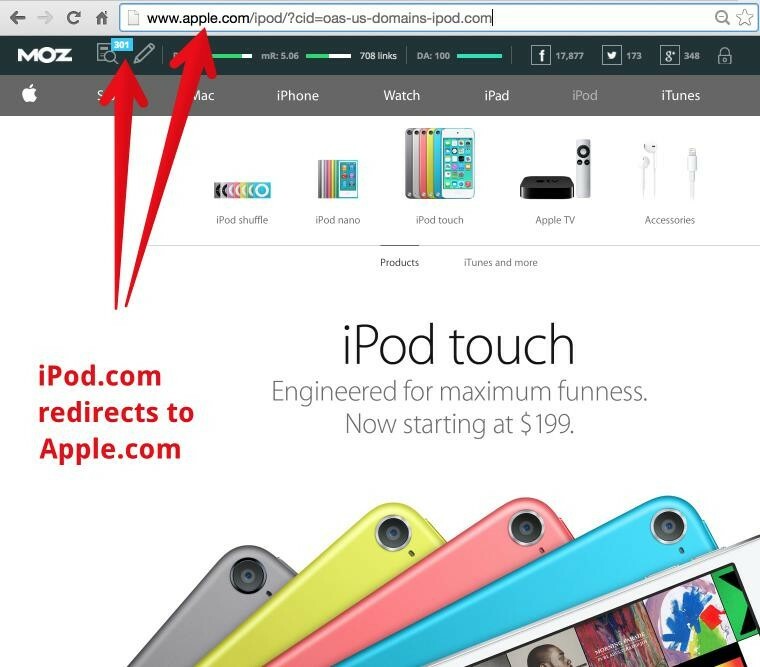 But when you try to visit iPod.com, it 301s to a subpage on the main site — http://www.apple.com/ipod/?cid=oas-us-domains-ipod.com. Back in the day, marketers would stockpile a bunch of articles on Ezine or a similar website. The articles would have something to do with their product, and contain an author bio link to the business website. Article. Link. Boom. SEO link juice came pouring in. The idea was that the business would gain rank through article directory links. 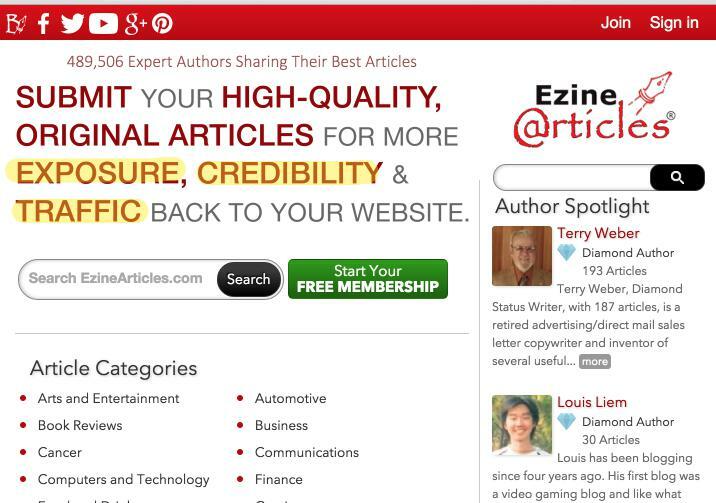 Ezine still touts itself as a great source of exposure, credibility, and traffic. The thing is, Ezine’s credibility is far past its zenith. In spite of what some may say, loading a site with Ezine backlinks reduces the legitimacy of your link profile. Ezine links lack the kind of authority that most websites need for a powerful link profile. Carefully and intentionally use guest posting on high-quality sites that are solidly within your niche. Use backlinks sparingly and cautiously, and only where necessary. 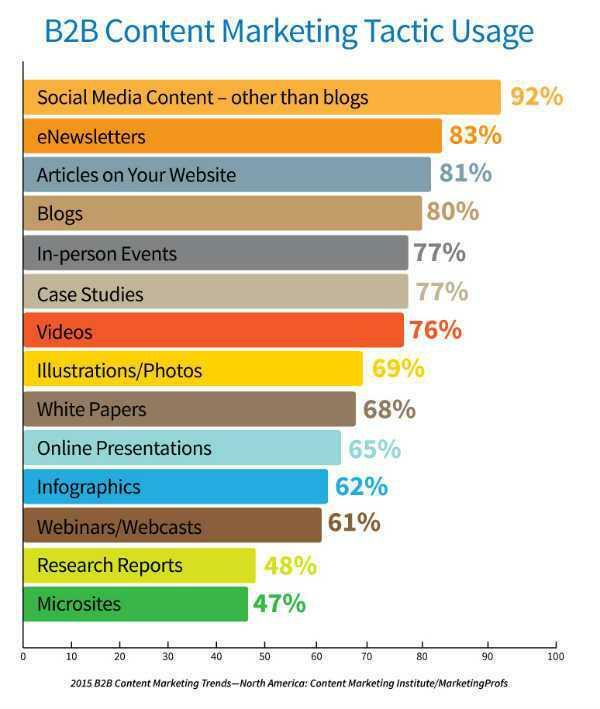 Some businesses, realizing the power of content marketing, have only explored one method in the varied arsenal of content marketing techniques. They invest the lion’s share of their marketing budget into this one method, and forget about all the other valuable techniques. Because “it works”. Maybe they are scared of trying something new. Maybe they think they don’t have the money. Maybe they don’t even realize there are different ways of doing content marketing. If we’ve learned one thing about SEO over the past decade it’s this: a technique that works one day might not work the next. If you place all your eggs in one basket, that basket may be ripped from your hands. Use a variety of content techniques to advance your marketing goals. There are plenty of options. Use a few, or use them all. But don’t rely on any one. Many companies, especially digital marketing companies, use these tracking codes to enhance a website’s data, search, analytics, or other aspect of the site’s performance. It’s not entirely dumb. You must have tracking codes on your website in order to get adequate data. All of my websites use a variety of plugins and tracking codes that furnish me with valuable data. It gets dumb when a site uses a ton of these tracking codes. Why? Because they can dramatically reduce site speed. Instead of providing value, the plugin and/or tracking code makes the website sluggish and slow loading. This, in turn, can reduce the site’s ability to retain traffic and gain rank. Optimizing anchor texts is the practice of making your anchor text include or consist of keywords. There is a fallacy that such optimized anchor texts will help the target destination rank for that given term. True, that used to work. Today? Not so much. Google explicitly targets this as a spam technique. Penguin and manual penalties have confirmed it. When you optimize your anchor texts, you are playing with fire. The best links are branded links, such as the name or URL of your company. If you must use a keyword, dilute it by making the anchor text include a whole portion of the sentence. Such links are sitewide, meaning that the link occurs on every page of the website, sending an extraordinary number of links to the receiving site. Companies who own subsidiaries or have multiple websites are most prone to this technique. Often, the sites are all hosted on the same server, making the risk even greater. Links are great, right? Helpful for SEO? If such insertions can send a high number of links to a receiving site, then why not? Sitewide footer links can be dangerous. They create an imbalance in the link profile. When you complicate the issue with optimized anchors and a medley of other best practice violations, you’re in trouble. Link to your other sites only where appropriate, and steer away from outbound footer links. If you must use footer links, make them nofollow and use branded anchors. I’ve worked with businesses whose marketing strategy involves reaching out to a certain demographic of bloggers or influencers, thereby gaining links, mentions, and other buzz regarding their brand or product. The process is fairly straightforward in its strategy. Identify an active online community with an interest in your product or service. Pitch them with a deal whereby they blog about your business, and then you reward the blogger with goods, services, giveaway, etc. It’s great for the blogger who gets a little sumpin’ sumpin’. It works for the business who snags a great link or mention. It works for the blog readers who may win something or participate in a contest or giveaway. It seems to be a win, win, win. Many businesses also engage in this practice because it is proven to gain links and create exposure. In limited quantities, this is a great method. In excess, it’s a problem. A massive multinational multi-billion dollar business that I work with has tried this technique a few too many times, against my advice. They reached out to the same group of bloggers, a blogging demographic which, I might add is not known for its adherence to web standards and SEO best practice. The spate of spammy links was nailed by Google as a “link scheme,” and the site ended up in Google’s penalty box. Go ahead and reach out to your preferred blogging demographic for an occasional bit of exposure. But do so with extreme caution. You should use this technique in limited quantities. Definitely don’t rely on it, and definitely don’t continue reaching out to the same group over and over again. You may look at this list and think, “Hey, I use that technique and it works fine.” I’m glad for you. I’m also suggesting that you be careful. We’re in an era of SEO in which there is far less wiggle room for tactics and techniques. Instead, we must create sites that are technically flawless, and that emphasize a seamless user experience. SEO isn’t dead, and it never will be. If you want to succeed, I suggest you slowly back away from these techniques.